Conservation of Historic Finishes — Bernacki & Associates, Inc.
Bernacki & Associates has the ability to restore and create any coating from traditional to contemporary. Antique, natural finish materials may be oil based or derived from tree resin. As natural finishes enhance the wood beauty, the modern coatings provide the durability for objects in frequent use. Shellac sets very rapidly. 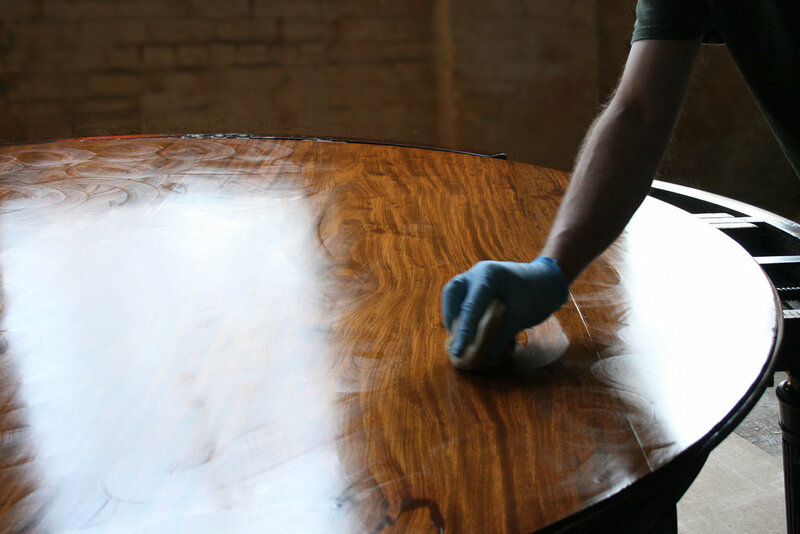 In the above photograph, there are visible circular strokes made during applying shellac with a French polishing pad. Conservation can be a funny thing. Sometimes it requires microscopy, vacuum tables, lasers and exotic materials. Sometimes it just takes a little warmth. A major piece by a prime Art Nouveau designer recently came in for conservation. The large piece was sound and stable structurally but had some very obvious problem areas in the finish caused by the introduction of moisture. The problem areas were all at the bottom but were still extremely visible, obvious and a serious distraction from the exquisite beauty of the entire piece. The main problem was a white/light colored circle (ten inches in diameter by one quarter inch in width) right in the middle of the horizontal display area at the bottom. This outer circle also contained five smaller, various-sized white circles within it. As you moved towards one end of this surface, there were large areas of variegated damage that spilled out over the edge and onto the angled and rounded apron. Shellac is an all purpose sealant and finish that is durable, time tested, and so non-toxic it is edible. It is environmentally friendly, renewable, and capable of incredibly deep rich finishes that are organically and aesthetically compatible with all woods. It can be used alone, with traditional natural finishes and coatings, and with modern synthetic mixtures. Shellac consists of a resin which is the secretion of the female lac beetle and the solvent ethyl alcohol. The lac beetle (Laccifer Lacca) is found in southwest Asia, primarily India. The beetles feed on the tree sap of three specific trees: Palash, Kusum, and Ber or Indian Plum. During the life and egg lying cycles of the female beetle lac is secreted to protect the beetle and the eggs. The branches are then harvested and the lac resin scraped off. This is called sticklac and at this stage it is still very impure with a lot of contaminants and debris. The process of conservation/preservation of an object or structure that contains historic significance can be very challenging if that object or structure must continue to be used on a regular basis. If that historic object or structure must also be brought into compliance with new and current regulations and social norms, those challenges multiply. The two elevator cabs were of the old gated operator run type. The elevators needed to be updated with new sliding doors and self operating controls as well as matching current safety codes. The elevator cabs have distinctive patterns of maple veneers that cover most of the interior walls with a top band of matching rectangles of sycamore veneer. These were very distressed but had developed a beautiful patina and tone to the woods. There was also a variety of cast aluminum sculptural elements incorporated on the walls and around the ceiling. The metal parts had a great deal of wear and accumulated grime but were structurally stable.